Blueberries, Art and Life: Where Have I Been For So Long? A Muralin'! Where Have I Been For So Long? A Muralin'! It's been an interesting month. 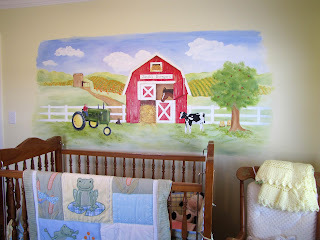 I thought after finishing the castle mural in the little girl's room that I would start right away on the barnyard mural in the little boy's room. Not so. One very ugly cold(?) virus, complete with all those fun things like fever, sore throat, cough, blah, blah... you know the routine.... plus one perforated ear drum due to severe congestion (yes, I've had all the fun lately ;-) kept me out of work for a week. What is it they say about the "best laid plans of mice and men"? 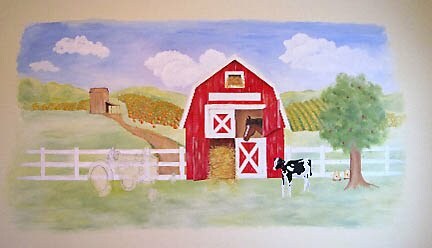 Thankfully, I finally ditched the virus and painted the barnyard mural (this one is about 5 ft high and 7 ft wide). I'm posting wip's. 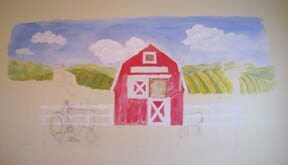 This mural took almost twice as long as the castle mural because the clients decided to add several elements to the original design (cow, the family dog, tractor, boy on tractor, pumpkins in field, tobacco barn and bee hives). But it was such a pleasure to paint... I really enjoyed it and hope the little boy does too! My working method was the same as for the castle: sketch on wall with a pencil, then paint. I used mostly Liquitex Acrylic paints, retarder and flow mediums. Also did an acrylic glaze for the first time and really liked the effect it gave. Will use that technique again. 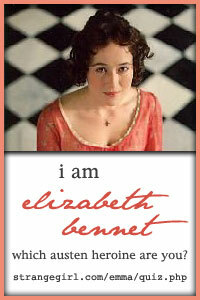 If I haven't visited your blog lately.... it's not because I haven't wanted to. I'll get around there as soon as I can so don't give up on me yet! A beautiful mural! I bet you really made the little boys day! Was wondering where you were. My wife and I had whatever nasty virus it was and really took the stuffing right out of us for a few weeks. Nasty stuff. Glad to hear and see you back to work. 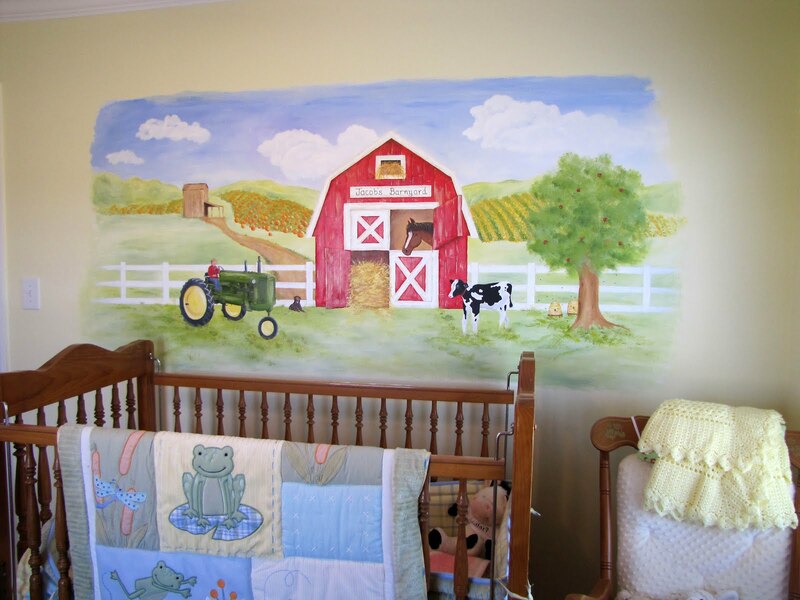 These murals are just super, Teresa. East your blueberries. I did and they work great. looks good Teresa. sorry you were so sick! Glad you are better and back with us. Sorry you've not been well, but it's good that you're better now. What a lovely mural. You are so talented! What's next? Go Teresa! This is wonderful! Hi there! so that is what you have been up to. 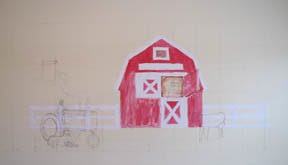 It always intrigues me to see paintings of red barns, we don't have painted barns here in the UK. I wonder why the farmers chose red? They remind me of Warren Kimble. Hope you are feeling on top of that nasty virus. Glad to hear you are feeling better! The mural is fantastic!!! I am sure the little boy loves it! The muralin turned out great! What a treat to see this latest mural. It is charming. 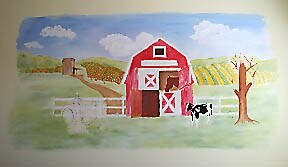 I'd love to visit this cheery farm!! Glad to have you back with us! Sorry you you were sick, and your mural looks awesome--you definitely had your hands full. O gosh, glad you feel better! That was a bad cold/flu? The mural of the barn scene reminds me of Wisconsin, they have people that go around and paint your farm, and they turn out similiar looking. I always loved the look of them. Made me want to live on a farm. I'm so sorry you were sick and glad you're feeling well again. This mural is delightful! I'm sure the little boy will love it! Beautiful mural. What a lucky little boy! I'm sure the little boy will be delighted. Can I just say that I am quite taken with your beautiful Bailey ;) Being a fool for cats. Nice mural. Glad you were able to accomodate the changes. A cold is bad enough but a perforated ear drum? yuck!